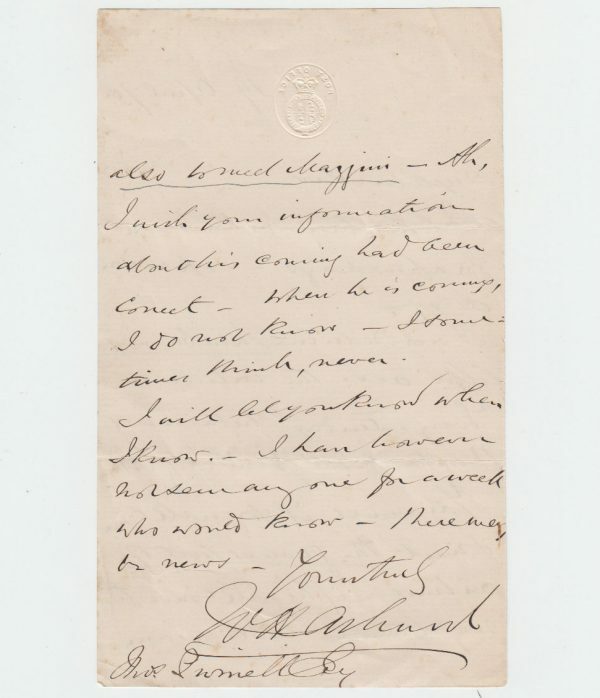 Autograph Letter Signed, to Thomas Purnell, returning Swinburne’s letter, and hoping that Purnell will be able to visit and meet Swinburne and Mazzini soon. 2 pp. 7 x 4 inches, in good condition. Post Office, 19 April 1870. William Ashurst (1819-1879), Solicitor to the Post Office. He was a friend of Whistler and his mother Anna Matilda Whistler. He was also a friend of Garibaldi and Mazzini, and of Robert Owen, a defender of Chartists and radicals, an advocate for the emancipation of women and for the subject nationalities of Europe. “You must, if you will, come & meet the greatest poet of our time – if he will come to my humble table again -also to meet Mazzini”.